For generations, formal adoption in America consisted overwhelmingly of white babies who were born to white, unwed women and were parented by white, married couples. Our laws, policies, practices, attitudes and understanding were based on that reality – and yet adoption in the 21st century has changed quite radically. The demographics of adopted children – and the characteristics of expectant and prospective parents – no longer look anything like the ones for whom the institution was first created. We need to examine the historic changes that have taken place, and ask ourselves: Is it time to stop tinkering and rethink how adoption in the 21st century should work? So says Adoption Nation author Adam Pertman, director of the Evan B. Donaldson Adoption Institute and himself an adoptive father. 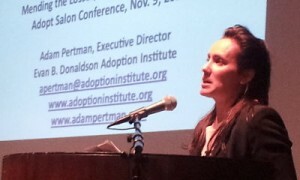 Adopt Salon founder, therapist Jeanette Yoffe — who was adopted out of foster care — opened this conference at the gorgeous Skirball Cultural Center in L.A. with an inspiring story about going to an adoption education event many years ago, and having a little girl run up to her and asking, “Are you an adoptee?? ?” This little girl seemed like she had never seen another adopted girl in the flesh. It was then that Yoffe decided she had to do something, to provide a place for adopted people to see, talk to, learn from and mutually support. She warmly introduced Adam Pertman for his morning keynote session at the Adopt Salon 2012 Conference. In all of us there is a hunger, marrow deep, to know our heritage, to know who we are and where we have come from. Without this enriching knowledge, there is a hollow yearning; no matter what our attainment in life, there is the most disquieting loneliness. Which makes up the highest percentage of adoption in America: infant adoptions, adoptions from foster care, or international? Like a good attorney, Pertman knew that even a supposed adoption-savvy crowd would answer incorrectly. Turns out that 100 million is a conservative estimate for how many of us in the U.S. have adoption in our immediate family. But the real stunner came as Pertman elegantly laid out the portrait of adoption in America in the 21st century. I thought I was being a smarty when I raised my hand for international adoptions being the most prevalent. Turns out they have been plummeting since their peak around 2005, and make up only 15% of adoptions. Most of the folks in the room believed infant adoptions are the most prevalent, but they are only 17%. Sixty-eight percent of the children adopted in America come out of the foster system. This is, on one hand, very good news. Children who need them are finding loving, secure, permanent homes. On the other hand, it is not good news when we are perceiving adoption in an outmoded way. The vast majority of Americans have a Father Knows Best image of adoption when the reality is so different. Legislators, policy-makers, other care providers, need to understand this. They are basing their knowledge and actions on a perception of adoption that doesn’t exist. That statistic doesn’t look to be changing, especially as the demographics of adoption are. Pertman laid out the research straightforwardly: the main reason for children entering foster care is abuse or neglect; and the vast majority of children adopted from overseas have spent their early months or years in institutionalized care. Do the math: foster care adoptions comprise 68% of U.S. adoptions, and international make up 15%. This means that 83% of adoptees in this country have experienced abuse, neglect, or institutionalized care. Some people see it as an indictment or a stigma on adoption that the use of clinical treatment by adoptive families is roughly triple the rate of that of biological families. Pertman’s point is, That’s a GOOD thing! Kids don’t experience abuse or neglect…or spend their relationally formative months in an institution…and come out not needing extra help. And clearly at least some of them are getting it. That is GOOD. The more we can all have a more accurate portrait in our minds and hearts about adoption in the 21st century, the more robustly our adoptive families can thrive. Finding biological relatives has become much more easy, and thus reunions more readily facilitated. The institutional impact of this is that it probably finally means the end of closed, secret adoption, and the rapid growth of more routine openness in adoption. The Donaldson Institute’s research into the impact of the web on adoption is continuing, and he invites any experiences / stories along those lines — how has the internet impacted your experience of adoption? — to be emailed to InternetProjectAI@gmail.com. 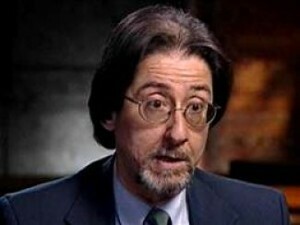 40% are mediated (information is passed through a liason, usually an agency or independent service provider / attorney). Adopted individuals are the only class of U.S. citizen not permitted to access our own original birth certificates. People unfamiliar with this are often really surprised to learn that when a baby is adopted his or her original BC is sealed by law and an “amended” one is issued, listing the adoptive parents’ names along with date and place of birth on this legal document bearing the title “Certificate of Live Birth.” It bears the state seal and comprises the first of many well-intentioned lies that adoption has been founded on for so many decades. Even though I met both my birth parents 35 years ago, I can still not go to Sacramento and get a copy of my original birth certificate! In those few open-record states, very few so-called “contact vetoes” or “do not contact” forms (which can be filed by birth parents who relinquished in the closed-record era and want to be “protected” from contact) have been filed. Assertions that the abortion rate would rise and the adoption rate would fall were records opened have not been borne out by the data. There is scant evidence, if any, that birth parents relinquishing babies for adoption were ever promised secrecy (which is a major basis on which those seeking to keep records closed constructed their platform). People reunite, people feel whole, people feel that the missing pieces of the puzzle of their lives get put together…and nothing bad happens. Rather than wanting to be protected from contact by their relinquished children as adults, Pertman says research reveals that the concerns of birth parents are quite the opposite. One of the biggest benefits of safeguarding the rights and wellbeing of first parents / birth parents is for them to have ongoing contact and knowledge of their child’s wellbeing. We’ve always acted as if a woman could give birth to a child and then just forget about it. It is the basis of law and policy and understanding. Now we have research showing that the single factor that helps women move on, heal, deal, is exactly the opposite of law: knowing what happened to their child! This entry was posted on Tuesday, November 13th, 2012 at 1:45 pm	and is filed under Parenting for Peace. You can follow any responses to this entry through the RSS 2.0 feed. You can leave a response, or trackback from your own site.